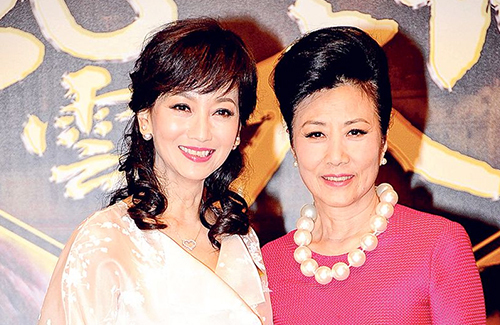 TVB legendary fadans Liza Wang (汪明荃) and Angie Chiu (趙雅芝) get along really well, but the onscreen foes admitted that they have not kept in contact in the last 30 years. In 1978, Liza and Angie collaborated in their first and only major project together, the classical wuxia series The Heaven Sword and Dragon Sabre <倚天屠龍記>. Portraying as opponents fighting for the love of Adam Cheng (鄭少秋), their amazing chemistry as enemies left a deep impression on the audience, leading to rumors that the two actresses actually fought on set. On Sunday, Liza and Angie attended a press conference for the new series Master of Destiny <風雲天地>, which premiered in Hong Kong on Monday, June 22. Liza and Angie were joined by the rest of the series’ cast, as well as the series’ producer, Wong Jing (王晶). Master of Destiny is a 50 million RMB co-production between TVB, Shanghai’s TVBC and Beijing’s NLCB. The 32-episode drama stars Liza as businesswoman and matriarch Kwan Yeuk Nam, who is caught between a large inheritance fight between her three sons, portrayed by Kenny Wong, Hawick Lau (劉愷威), and Edwin Siu (蕭正楠). Angie stars as Kenny’s birth mother. She did not understand why they were having rumors that they did not get along, explaining that they rarely collaborated, had different images, and filmed different dramas. Their last drama together was the 1979 wuxia series Chor Lau Heung <楚留香>, in which Liza was a guest star. They are not friends doesn’t mean they have to be enemies. Media always like to spice things up. Sometimes people just don’t get along, but doesn’t mean they hate each other. @tess Agree. People don’t get along well if they have different personalities and different points of view, but they are not enemies either. @tess Leave it up to the media to make a mountain out of a molehill (or, in this case, a molehill out of nothing). It’s almost as though the media can’t survive without stirring things up in some way….of course we’re all used to it by now, but it’s still annoying and frustrating…. Anyway…have people started watching the series? Any thoughts? Personally, I’m annoyed with the dubbing (especially since the non-HK actors/actresses I’m familiar with and know how their real voices sound like)….but then again, that’s just me and my personal pet peeve. No comment on the story or acting yet, since too early to tell at the moment…. I feel annoyed with the dubbing too. Somehow this series doesn’t give me the urge to keep on watching. As if, it doesn’t matter even if I miss a few episodes. @jnsw Is it just me or does the Cantonese sound dubbed as well? In today’s episode, I noticed that when the HK actors (Liza, Kenny, Hawick, etc.) were talking, the way they moved their mouths didn’t match with the pace of the dialogue (there seemed to be half second delay at least)…the voices were definitely theirs but the timing was off. Either the sound quality is really bad (which is probably the case) or they re-dubbed the Cantonese after the fact for some reason (makes no sense why they would do that for the HK actors)…. Also, did Wong Jing use the same cameras he used back from his 1970s series to film this? The aesthetics are horrible — some of the scenes look way too fake (or it could be I’m too sensitive to that now after several months of watching “real setting” series with beautiful scenery…. @llwy12 Maybe some scenes dubbed with their own voices but mostly recorded live I think. They can be colleagues. Not all colleagues are friends.Liza never give me an impression she is easy to befriend or is those warm hugging sort of friend friend. Ditto. Liza Wang has never struck me as someone easy to get along with. Angie Chiu – well let’s say she always present her most perfect side – model always-smiley couple type, with Melvin Wong. But if I recall, she was married when she met Melvin Wong. Put all these personalities together, all with egos and liking the limelight on themselves/pulling ranks = hard to say who really gets along with who behind the scenes. But if I recall right, she was also married when she met Melvin Wong. I don’t think Liza Wang has too many close friends in TVB. She is more a loner to me. i feel like kenny and the girl who plays hau yee are miscast. kenny looks way too old to play angie’s son or even liza’s, plus he’s not a very good actor to begin with. hau yee looks very plastic and heavily made up. i would have preferred to see tiffany tang as the second female lead. and i felt no chemistry between hawick and liza in the opening scene. Sorta watching Master of Destiny and didn’t know Tang Yan was in it and this series managed to make her look like she ran a marathon. Everybody looked weird except for Liza who surely is the one true natural beauty. The one who player her errr daughter? Not sure what… anyway sorry to say she freaks me out. I find her exceptionally unpleasant to look at. Entire feel looks old, dated and most are miscast. I think for 2 episodes, storyline is OK so far. But Harwick Lau ( i have not watched any of his chinese series), but comparing what i saw years ago in his TVB series, and now, i am not impressed. He is not acting, more like posing most of the time…..
Agree with you on Hawick. I find him looks awkward, as if he has gone for plastic surgery, The make-up is so thick that they all look fake. @moon16 He was never a fantastic actor to begin with but yes, seems tight, frozen when his role demands otherwise. I am never a fan of any Dubbed films/series. I like to watch films/series in the original voices and I then look at the sub titles..
As to whether the 2 ladies are friends or enemies???? well I mean what its got to do with us.. we just like to watch their acting..